[April 9, 2019] A CEO’s work is never done. According to a 12-year study, CEOs and other executives tend to work on average 9.7 hours on weekdays, 3.9 hours during their weekend days, and approximately 2.5 hours on average daily while on their vacations. Making crucial decisions, as well as managing and streamlining the workflow, needs executive’s continuous presence, meaning that their time is their most valuable asset. It’s evident that time plays an important role in their line of work, which is why it needs to be handled properly. The right time management techniques can be a make-it-or-break-it factor when it comes to the performance and productivity of company leaders. One of the best-known time management tactics starts with marking your tasks based on how important and urgent they are. They need to be listed in one of the four quadrants, the first of which should contain the tasks that are important and urgent, meaning that they should be done immediately. The second quadrant is for the tasks which are important but not urgent, that is, those that don’t have to be addressed right away. The third quadrant contains the tasks which are urgent but not important, and which can be delegated to your employees. 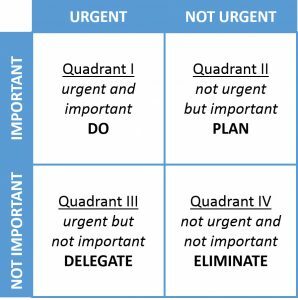 The tasks that fit into the fourth quadrant, that is the “not important and not urgent box”, can be eliminated whatsoever. Determining your biological prime time during which you can get the job done efficiently and effectively is a great technique for every leader. Monitor your work activity for a few weeks and try to identify during which work hours your energy levels peak and try to organize your activities accordingly. Although it’s not always possible to use this technique as some meetings and obligations will require you to deal with them as you go along, you can greatly benefit from scheduling your important tasks for your most productive hours, as well as leaving the less important stuff such as email correspondence or telephone calls for the low energy ones. A productivity journal is a great tool which can help leaders to list their to-dos and keep track of the time needed to finish the tasks. In addition to keeping a productivity journal, you could also use a free time card calculator to plan your own activities, monitor and manage the activities of your employees, as well as calculate pay and earnings. The same study has shown that the average CEO spends 72% of their time in meetings. That means they sit in approximately 37 meetings every week instead of saving their energy and focusing on more important things such as dealing with the matters related to investors or customers. If your meetings don’t have a precise agenda, then they’re nothing but huge time eaters. Some of the staff meetings can easily be replaced by team management tools, which leave everyone the space to organize according to their own workflow, and still get all the information and feedback they need. Try out some of these techniques and give your productivity a boost. Marko Maric is a marketing manager and a blogger. He frequently covers topics on business, marketing, and productivity. Follow him on Twitter @mmmaric (https://twitter.com/mmmaric). Thanks Marko. Yes, a leader’s work is never done but the lesson is to not let “work” overwhelm you or you become less effective. Thanks, Scotty. Exactly, if you as a manager want to tackle everything at all times, you can, no problem. The harder thing is not getting too involved in every detail and to learn to delegate and trust your subordinates. Mr. Maric, well done! Keep up the good work. Is there another place we can go for more of your articles? Thank you for the kind words, Kenny. I mostly blog on various websites, but tend to share my articles on Twitter, at @mmmaric. My best time to get things done is in the morning. I get to work early, check my emails, write letters, jot down the main items I will do that day (i.e., planning), and think a little about how I can insure I’m meeting the vision I established. Later in the day (I’ll be getting tired out at about 10 hours into the workday) I’m mostly functioning on brute strength. I think you have a good system … similar to how I do it. What you cannot do is allow yourself to be distracted during the day, so get the small stuff (that requires some undisturbed thinking) out of the way. Just keep a watch on a potential burnout. It can be a serious condition. Loved the article. We have a number of guest articles and your post today was certainly among one of the better. Thank you, Nick. It means a lot. Marko, well done. Yes, a “leader’s” work is truly never done! Frame it! Yes, but making a good system and smart delegation can cut you some slack. Not everybody wants that, though. Good article and some great stats. Thanks. I was shocked to read in your article that 72% of a CEO’s time is in meetings. That sounds way too much for them to get anything done. I agree, too much time in meetings. I would think that senior leaders could think up something better to do with their valuable time. The problem is that meetings are oftentimes not productive and to the point, so the great amount of time is wasted.